What do you buy your celebrity girlfriend for her 19th birthday when her driveway is already filled with expensive vehicles like a Ferrari 458 Spider, Rolls Royce Wraith, and Mercedes G-Wagen? 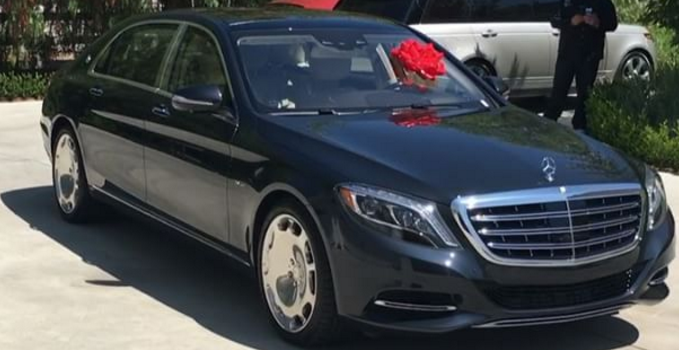 Well, if you’re a famous rapper who goes by the stage name of Tyga, then the answer to that riddle is pick up a new Mercedes-Maybach S600, go all out by putting a fancy red bow on it, and then film her reaction as you go to the driveway to unveil the car. Luckily for her adoring fans, this dramatic seen has been posted online for public consumption via Kylie Jenner’s official Instagram, Twitter, and Snapchat accounts. In the short video, as soon as Jenner noticed the fancy new Mercedes, she yelled, “I love you T!” Tyga, real name Michael Stevenson, then sang happy birthday to the reality TV star. According to Mercedes-Benz USA’s official web site, the starting MSRP of the Mercedes-Maybach S600 is $191,975. That may sound like a steep price for such a conservative looking car, but underneath the hood of the S600 lies a 6.0-liter biturbo V12 engine that pumps out a whopping 523 horsepower and 612 lb-ft of torque. This powerful motor allows the S600 to rocket from 0 to 60 mph in 5.0 seconds, despite the fact that it has a curb weight of approximately 5,300 pounds.